HELLO, PLEASE LET US KNOW WHAT CAN WE HELP YOU WITH? What’s the use of bulk SMS services? Bulks SMS can be used for promoting your products & services, sending offers to the customers and discount schemes to the customers etc. What’s the difference between transactional & promotional SMS? Transactional SMS are those sent to your existing customers/users/clients about the product or service dispatch/delivery/alert notifications and which can be sent 24*7. Promotional SMS’s are used to promote your business to any mobile number in India and which can be sent 9a.m to 9p.m. To register with us please fills the form on the contact page. One of our executive will get in touch with you and take you through the procedure. We have the facility for customers to check the aggregates and delivery reports instantly for each and every SMS pushed in a day or a month and MIS for a year. For transactional account depend upon the agreement with Pinnacle and for promotional account you will get automatic refund for all SMS pushed to the DND numbers on promotional gateway. You can buy the SMS credits by paying us the total cost of SMS package in advance through cheque deposit. Yes, you can have multiple sender ID’s for both transactional/promotional SMS. Are the messages delivered to the DND Numbers? SMS sent through transactional route will be delivered on DND numbers which will require DND agreement with pinnacle. Typically messages are delivered within 15 seconds on the premium route and within 3 minutes on the standard route, but usually even faster. The best is to test it for you. You can send SMS to almost any operator in India. Can I purchase a new bundle plan with higher or lower units when the existing plan expires? Yes. you can purchase new bundle plan with the higher or lower unit before your account gets expired. Sometimes I receive duplicate message. This happens in very rare circumstances. This may occur when you are on roaming, or in a very low signal belt. I have not received or forgot my password. Please mail us at support@pinnacleteleservices.com from the registered e-mail ID with us. Kindly mail us all your queries or suggestions to support@pinnacleteleservices.com We are happy to help you. Can I use transactional route for promotional or vice-versa? No, because settings related to both the account is different. Is there facility of API for text messaging and template? Yes, we have multiple API's as per requirement of bulk submission. How to get support for my queries? If using an API for sending text and template messaging and getting error as ES1001 authentication failed (invalid username/password), what needs to be done? Check whether username and password you are entering is correct if yes, then need to avoid special characters in username and password. In an API for template messaging, can we use template ID which is not related to user account? To maintain authentication we need to use own template ID's related to our own bulk SMS account. While sending Unicode messaging, sometimes submission of messages is with junk characters, Why? It's because concern mobile handset doesn't support Hindi/Marathi fonts. What is limit of pending SMS? Its vary from operator to operator but usually 30min's to 4 hr. Does pinnacle provide bulk messages delivery in the region of Jammu & Kashmir? Due to security purpose, delivery of bulk SMS is restricted in the region of J&K. Want to access bulk messages account from your own website, is it possible? Yes, it's possible. Create your sub-domain and redirect it to the IP_ address 103.225.76.43and provide us the same sub-domain so that we can configure that at our end. What is the limit of Text Messaging, Template Messaging and Unicode Messaging? What is the character count of Messages? If entering wrong user name and password for more the 3 Times what it is result a how can it be overcome? Concern person IP address is banned (account is blocked). In order to release the IP, you need to drop us an e-mail on support@pinnacleteleservices.com along with screen shot of the IP. A specified message contain with static and dynamic form whose nature should be Transactional and will be added by us in client user account. Template has the privilege to get delivered on DND number only after DND agreement with Pinnacle. A privilege assign in user account where user provide us with a group of number an all this number are provided open DND by us (DND FREE) against the sender ID registered in the user Account. A privilege assign in user account where Open DND Route is Provided against the registered sender ID i.e. messages will get Delivered on DND numbers. What is the basic requirement to get sender ID? User account should always be transactional. What is missed call services? How can I get the details of missed call? We provide the user interface to monitor the response of online campaign. Or We can configure the API provided by client/customer. Can I send automated reply/feedback SMS for every missed call? Yes, we can configure that for you. How Many Missed calls I can receive? One Primary Rate Interface (PRI) can handle approx. 50 simultaneous miss-calls / min; hence requirement of additional PRI lines will depend on the volume of incoming traffic. How it can be useful for the business? All the missed call numbers will be store into the database &those numbers can be helpful for the lead generation, verification process, Generate / Retrieve Password, Opinion Polls, Live Event Voting, Coupon Delivery, Customer Feedback, User Verification, Rating System, Opt-in List building, Information pulling, Call back request, Contest Lucky Draw. Toll-free service is a one-way incoming long-distance service that allows a business/Organization to receive calls at no charge to the caller. Toll-free numbers are increasingly popular for professional as well as personal use. Toll free number is a way to attract new customers for any business and helps to build customer loyalty. It is also a good way to assist traveling employees. What is the service charge for setting up a toll-free number? There will be a charge for setting up a toll-free number which will depend on flow of activity. Yes, we will provide a separate bill for your toll-free under our company name but not the complete summary of the numbers. Your toll-free number can be sent out to people through an SMS campaign activity, newspaper ads, TV ads or through social media. If I move locations can I take my toll-free number with me? Yes. you can… because it’s a virtual number. Who is able to call my toll-free number? Anyone who is in the know of your Toll-free number can give you a call. Are there any display options available? Can I have my toll-free number terminate on multiple phones? Yes, our optional routing features give you the flexibility to route your calls to different terminating locations. No. Our Toll- Free Number Service does not require any special equipment. When you are provided with a toll-free number and you are authorized for our service, we will set it up for you. Thus, you can attend toll free incoming calls through either fixed telephone or mobile phone. How long before I can start using my toll-free number? Once the number is activated and the technical part of developing the flow of the Toll-free number is done, you can go ahead and start marketing your number. How many calls can my toll-free number take at a time? Businesses/Organizations can receive thousands of calls simultaneously without any impact on their service or that of other customers. If your toll-free number will be taking large volumes of simultaneous calls, we recommend you to contact our technical support to increase server efficiency and PRI. Yes. If you already have a pre-recorded message that you would like to play for your customers calling you, you can share it with our team here and they will upload it on the Control Panel. What if I face any problem and have any issue in service? You can contact us any time in case of any forms of issues through the contact details which is available at our website and we will resolve issues as soon as possible. How long will my toll-free number take to be activated? You can start using your toll-free number on the date it is allocated to you. Are there any restrictions on numbers that I can possess in my account? No, you can have any number which would you like. but charges will be applicable accordingly. IVR applications can be developed by Pinnacle’s professional staff in a timely manner. Prior to signing an agreement, our personnel will analyse the IVR requirements and these will be jointly approved by both you and Pinnacle. Once the contract has been signed, we will begin developing the flow of the IVR and will provide a test version for you to approve. Once approved and further tested, it will be implemented at our IVR call centre. This entire process generally takes just a few days or weeks, depending upon the complexity of this application. Pinnacle estimates typical monthly usage at the point of contract and includes one month’s deposit upfront. Thereafter, we provide end of month billing to clients showing service usage as well as any monthly fixed fee. Who creates the flow of the IVR? The customer can create the flow and record it at their end. If the customer wants us to record it, there is an extra charge for that. Is there a limit on the length of the IVR flow? No, there is no such limit. It is your choice on how long you want the flow to be. long should the flow be? Can I listen to the message again by pressing a defined key? Where is my voice application/IVR stored? The Voice Applications/IVRs are stored on our servers. Is there a limit in option numbers I can have? Yes, 9 is the maximum number of options allowed for an IVR Survey. If there are more than 9 options, the question will become invalid. Can I transfer a call when using the IVR? Yes, you can. When you have received a call through an IVR you can transfer it directly to the concerned department once defined in the flow. Is "Music on Hold" supported and if/so can I choose the audio file that plays? Yes, "Music on Hold" is supported by default on all account as part of our IVR Feature. Unfortunately, the "Music on Hold" audio cannot currently be changed/updated on a per-user basis. What audio file formats are supported for upload with the IVR Feature? We support ".wav" with specification of format PCM (uncompressed) and attributes: 8.000 Khz, 16 Bit, Mono. What is the "Timeout" setting for? This is the maximum amount of time (in seconds) that is allowed for a caller on your IVR to enter a choice after the recording (IVR Menu Audio) is finished playing. You can set the Timeout Interval to any value as per your requirement. What happens if a caller to my IVR enters an Invalid DTMF Prompt while the "Menu Audio" recording is playing? An error message can be played according your requirements informing the caller about the error. A technology in which pre-recorded messages are automated to mobile/telephone users called as Voice SMS or Outbound Dialer (OBD). One can dial out list of phone numbers and play pre-recorded message through voice SMS or Outbound dialer (OBD). 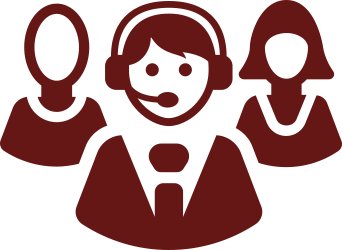 An inbound call is one that a customer initiates to a call centre or contact centre. A help desk handles inbound calls as well, although calls may be made from employees rather than customers. A call center may handle either inbound or outbound calls exclusively or might deal with a combination of the two. Pulse is of 30 seconds. How many languages does your Voice service support? Our system supports all 22 official Indian languages. There is a validity clause. It depends on your Purchase order. No, there is no limit on the numbers that can be uploaded. Please make sure that phonebook is either a CSV or a TXT file. Can I set a caller-id of my own choice? For outbound calls the number cannot be changed as masking of numbers is against TRAI regulations. Yes, you can schedule calls on both mobile and landline numbers. Please make sure that the number entered is a ten-digit number for example: Mobile Number should be entered without 0 or 91 (9711520500) Landline numbers should be entered with the std code omitting 0 (1146208080). What is the calling capacity of your system? We can make 6000 calls simultaneously. 20 Lac (approx.) calls can be done through the system in 10 hours. Actual throughput depends on network load conditions. We work on a prepaid model. As soon as you deposit the money in our accounts, the credits would be given to you. The credits will be deducted for any of the services that you consume like outgoing calls / incoming calls. Where is my voice application / IVR stored? The Voice Applications / IVRs are stored on our servers. How is integration with existing applications handled? Integration with the existing applications / website can be done through APIs. Once you have shared such a requirement, our technical team will get in touch with you to help you set it up. What is High Risk/Low Risk Number in Inbound Calls panel? Low Risk Numbers are the numbers which are reserved for incoming calls only. High Risk Numbers are the numbers which we also use for outgoing calls and it may get disconnected due to Do Not Call Requirements. Whenever someone buys an incoming service, he is assigned 2 Numbers - Low Risk and High Risk. Low Risk Number he can publish on his visiting cards/pamphlets etc. and High-Risk number, he can use as the Sender-ID while making outgoing calls.